you know what makes me happy? mexican food. i’m super lucky because there’s a darn tasty mexican restaurant in walking distance from our house. due to the delightfully walkable proximity of mexican food, it’s no surprise that i rarely cook mexican food at home. instead, i put on my shoes + make the 5-minute stroll to a glorious place where margaritas, guacamole + enchiladas are delivered to my table in a matter of minutes. ah yes, that is a heavenly place indeed. but, inspired by my one-new-dinner-a-week challenge for 2012, i decided to try cooking mexican food myself + put quesadillas on this week’s dinner menu. i made a grocery list + the first thing i put on there? flour tortillas, of course. 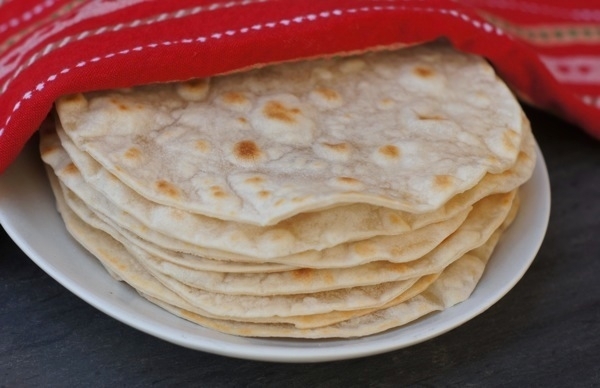 then i remembered seeing homemade flour tortillas on my friend ashley’s blog. i figured, if i’m going to do something new by cooking mexican at home, why not go all out + make the whole meal from scratch, tortillas included? so that’s what i decided to do. and the result? they turned out fabulous! i was surprised at how easy they were to make – the dough came together in less than 5 minutes, + they were a cinch to roll out into pretty circles. they cooked up quickly + easily – the entire process took me less than an hour from start to finish. + the flavor? simply delicious + tons better than the store-bought version. they’re also awesomely customizable – you can make tiny ones for mini soft tacos, giant ones for oversized burritos, + everything in between. i’ll be using the standard 8” ones pictured here for my first ever attempt at quesadilla-making tonight — wish me luck! in a large bowl, blend the flour + shortening until the mixture resembles fine meal. in a small bowl, mix the salt + the water until the salt has dissolved. using the dough hook attachment of a stand mixer, add water to the flour mixture, mixing until the liquid is incorporated. mix for 2 to 3 minutes, or until smooth. if you don’t have a stand mixer, stir the liquid into the flour mixture with a wooden spoon, then knead by hand. divide the dough into 12 equally-sized pieces + roll each into a ball. roll each ball into a thin 8 inch round – i rolled mine out as thin as i could get ’em — this keeps them soft + pliable once they’re cooked. after i rolled them out to circles, i took an 8” salad plate, turned it upside down on top of the circles, + cut off any excess around the edges. voila! perfect circles. cook each round in a heavy non-stick pan over medium-high heat, flipping once, until puffed + golden on both sides, about 3-5 minutes per tortilla. 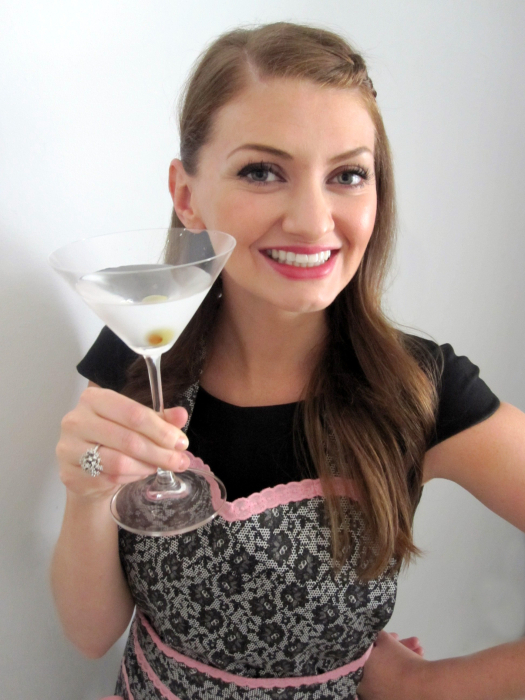 you’ve gotta try ’em, jenn – they’re soo easy (+ so delicious!). let me know how they turn out! 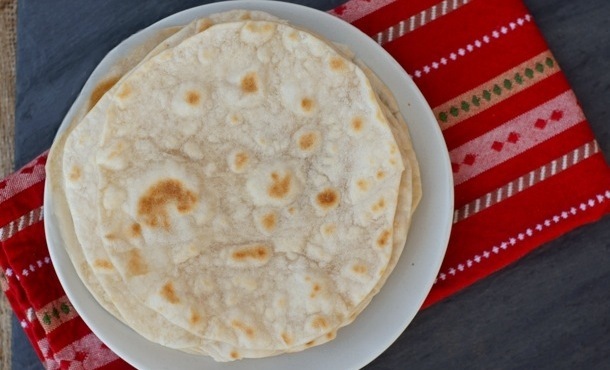 I love your resolution…and these tortillas! There are quite a few Mexican restaurants near my house too, but sometimes nothing beats homemade. i agree, sarah – there’s something so nice + satisfying about being able to make certain things from scratch at your own house, even if you can get ’em a restaurant in walking distance. =) thanks for your kind words! Amy, I’ve made homemade tortillas once. It’s the way to go. You got it down perfectly. You can use a tortilla press, but I found I also could do it by rolling. Now I’m a little more inspired to try again. thanks so much, angela! i’m thinking of getting a tortilla press if i find myself making these frequently – it would definitely save a bit of time, although i don’t mind rolling them out by hand, either. decisions, decisions! I’m pretty good at making pita bread, but I haven’t perfected my tortillas yet! Yours look amazing! thanks for the tip! a bunch of people mentioned adding a bit of baking powder to the recipe – i’ll definitely try that next time! you are so incredibly brave. i’ve been ‘wanting’ to try a project like this forever….i’ve just never actually taken the plunge.